Producing and recording a podcast is an endeavour that on the surface may seem simple but if someone new to the world of podcasting was to jump right in, it would be very overwhelming. Since we started RSBANDBUpdate! in 2005 we’ve gone through a variety of recording setups, all becoming more refined than the last. This month I wanted to talk a little bit about the recording and editing side of the podcast since they’re in some ways a black art for listeners and now viewers. The most important thing to understand when it comes to podcasting is that a podcast setup can be as simple or as complex as you need it to be. It can be as simple as a couple people sitting around a microphone chatting. It can also be as complex as harnessing the power of a studio that rivals that of CNN. Our current setup sits in the middle after having moved from simple to slightly more complex over the years. The most important feature of any podcast setup is the content being discussed. If the content is bad, no matter how good the setup, the podcast will be bad. Focus on content and being yourself before investing copious amounts of time and resources into a podcast setup. Now with that being said, the setup about to be laid out works for our purposes and may be far from optimal or feasible for anything you may want to try in the future. Logitech H390 USB headset – This headset is one of the most basic USB headsets available on the market and has been around for years. It can normally be found pretty cheaply on Amazon. This headset utilizes a pure USB connection preventing any analog noise from creeping in from your computer. It also has a good microphone that is clear. Think of this as the entry level microphone. 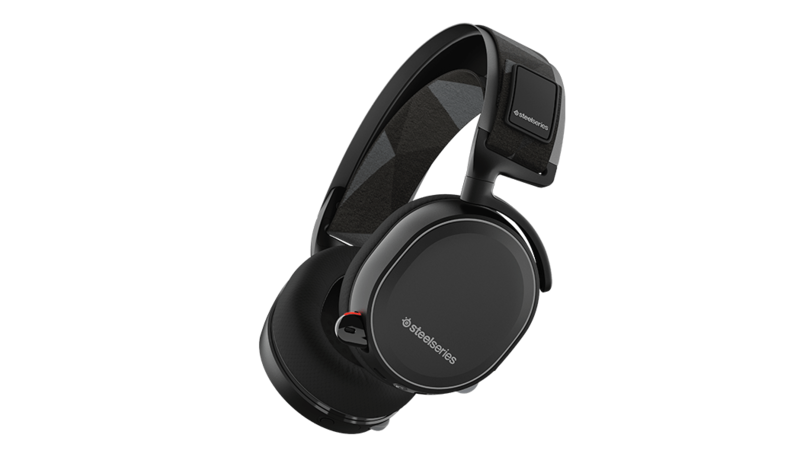 Steelseries Arctis 5 and 7 – These headsets are functionally identical except for the fact that the Arctis 7 is wireless. They’ll do wonders for podcasting and have the added benefit that they are excellent for gaming as well (PC, Xbox, PS4). The highlight once again is the microphone sounding crystal clear and USB connection. The Arctis 5 and 7 feature a microphone that is bi-directional which does wonders for room noise reduction. A number of hosts currently use the Arctis 7: Brad (Chief Snake), Cireon, and Earth. ATR2100-USB – I haven’t used this microphone personally but have listened to podcasts where it was in use. It sounds good and should be the first microphone you look to if you want something dedicated for podcasting. The benefit of this microphone is that it’s a dynamic microphone with a cardioid pickup pattern which means like the Arctis 5 and 7 it has excellent noise reduction. It also affords good future expandability in that it can connect to your computer via USB or to a mixing board. Rode Podcaster – This microphone effectively takes you to the prosumer level of recording hardware. The Rode Podcaster is once again a dynamic microphone which means it will have decent off axis noise reduction. The Rode Podcaster connects exclusively via USB which precludes it from being connected to a mixing board. For a microphone that is effectively a broadcast microphone you will need to invest in a stand, preferably a shock mount, and pop filter. The shock mount prevents vibrations from your desk or keyboard from making their way into the microphone. The pop filter prevents your ‘P’ and ‘B’ sounds among others from shaking the listeners ears. If you’re fairly certain you won’t be using a mixing board and just want a USB connection, this is the top end microphone you should be considering. Heil PR 40 – The Heil PR 40 is a true broadcast microphone and can be found in many radio stations. The Heil PR 40 connects exclusively to a mixing board or audio interface. This means that in addition to the stand, shock mount, and pop filter you’ll also be looking for a mixing board or audio interface. 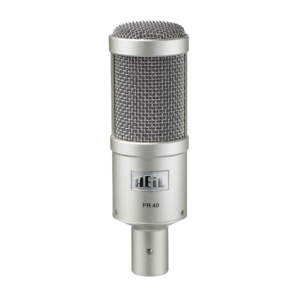 This microphone is tuned specifically for human voice and gives a very lush warm sound. It also has excellent noise rejection to the point where if you turn your head it will sound as though you’re on the other side of the room. When my last setup fell apart I moved to this microphone only because I had planned expanding Update and starting up another podcast. I would not recommend this microphone unless you have a severe dedication to podcasting. In summary if you’re guesting on a podcast the H390 will suffice. 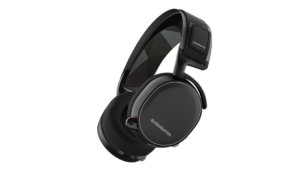 But if you want to bring gaming into the mix, go for one of the Steelseries Arctis headsets. If you’re wanting something dedicated at a introductory level the ATR2100-USB is great. If you want something truly professional the Rode Podcaster or Heil PR 40 depending on your use of external hardware. With the Heil PR 40 and potentially the ATR2100-USB you will need an external audio interface. These come in two forms, either an actual audio interface or a mixer. When building this my current audio stack at the start of 2016 I was coming off years of using software audio routing. 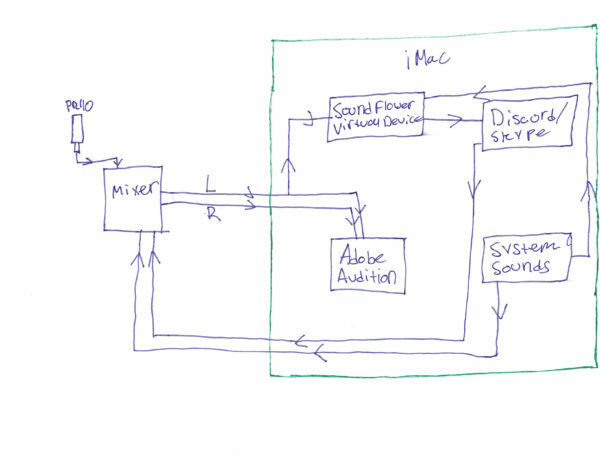 The audio routing I was using suffered as a result of changes to macOS that introduced lag into the setup. By the end of podcasts it was not uncommon to have a second or two of audio lag between the different audio tracks. This told me I needed something that would just work. The simplest solution was to get an audio mixer that would abstract all of this away. I went with a Mackie ProFX8 v2 since it met the feature set required. This included: USB output, aux sends (ability to send a track out over a different output i.e. send my mic output but don’t send the Skype participants), and enough tracks. In reality 4 tracks would probably be enough but the 4 track version doesn’t include USB output. Behringer also makes decent mixers if Mackie doesn’t have any products that you specifically like. A Mac. I use a Mac with my podcasting setup for two very critical reasons. The audio system of macOS is truly robust and lets you do some very interesting things out of the box. First is that there’s a great piece of freeware called Soundflower that creates a virtual audio device. Secondly, is that the system lets you create what are called Multi-Output devices. These are virtual audio devices that combine audio devices on your system for output. What I end up doing is creating one of these Multi-Output devices so that my system audio output (listener questions, YouTube videos, etc.) gets sent both to the mixer for recording and over the same channel as my voice to those on Discord or Skype. Finally, Audio Hijack Pro, today Audio Hijack Pro just serves to split the output from the mixer (that has me on the left track and guests on the right track) into separate audio devices so that I’m not feeding back the guests audio to them over Discord or Skype. Recently this also let me split audio into separate tracks for our video recording but more on that later. 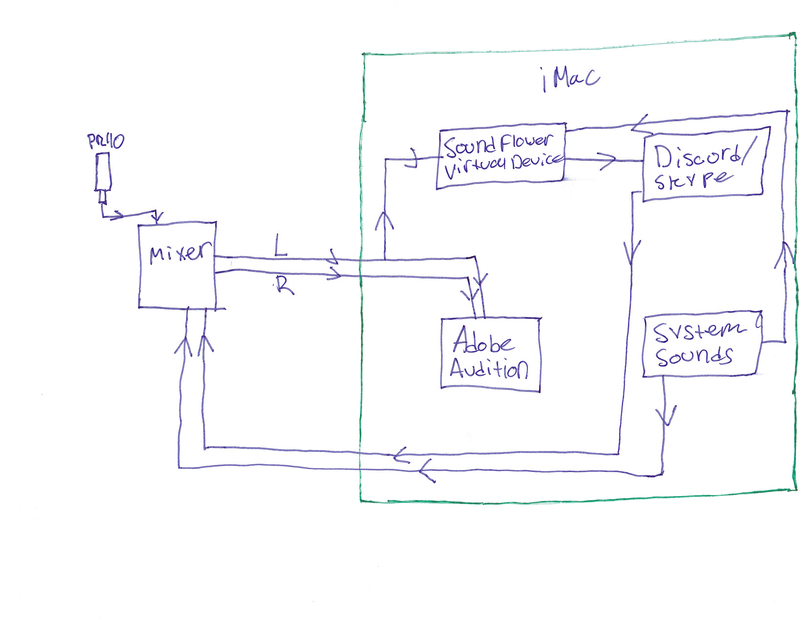 It is these 3 sections of the audio system on macOS that prevents me from recording on Windows and limits this type of setup to a Mac. Run an equalizer to make the vocals pop. This means raising and lowering certain frequencies unique to the individuals voice. Match the volume of everyone on the podcast. Sometimes microphones come in at different volume levels, this just brings these in line with each others perceived loudness. Compress the audio. Compression levels the audio so that there’s less variation in volume levels. With compression it’s possible to make it so that a laugh is as loud as a monotone soliloquy but we don’t go that far. After this any cuts to remove interruptions or profanity are made. The intro and close out music are applied and the teaser and show title are attached. To finish up the editing session the final version is exported as a 64 Kbps mono MP3. The show is then uploaded to the website with appropriate show notes and pushed out to the iTunes feed. Recently we’ve started recording video for the podcast as we’ve reached our Patreon goals. For this we utilize OBS (Open Broadcaster Software) to live switch inputs while recording the podcast. To make this as painless as possible we’ve swapped back to Skype since their newest version ships with NDI output. NDI (Network Device Interface) gives us a video (and audio feed if we want it) from each participant on the call. These can then be input into OBS at full 1080p HD resolution. As of writing this article, our video workflow is evolving. Talk to us again in 6 months time to see if it’s the same. If you have any questions in particular feel free to comment on our forums or send me a direct private message! This article is filed under Tech. You can follow any responses to this entry through the RSS 2.0 feed. You can discuss this article on our forums.